Big news on the job front: I found out this past Saturday that I was accepted for a job at the Expo 2010 Shanghai! It starts in a month and goes for 6.5 months into November, and as far as I know (which isn’t very far) involves being some sort of “hosting” staff at the Canada Pavilion. Representing Canada. So I’ve been suddenly inundated with all sorts of paperwork, part of which apparently goes towards “top secret” security clearance checks. During the information-gathering process I realized that in the last ten years I’ve resided at 16 different addresses—13 of which fall into the last five years. I know I’ve moved around a lot, but those numbers still put my recent life into some perspective. OK, not even counting the fact that I don’t know what “apex” and “HSP” are and that I’m probably gonna mess up at least one of these measurements, one disturbing question remains: WHY DO THEY NEED ALL THIS INFORMATION?!?! 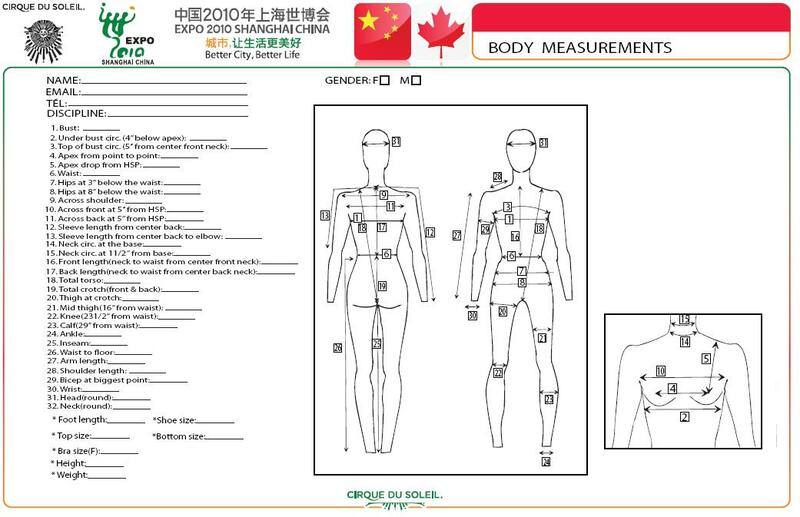 Considering that the Canada Pavilion will be hosted by Cirque du Soleil, my only (supremely terrifying) conclusion is that they will be putting me in a body suit. Cat suit. Whatever. Something skin-tight (who would otherwise care about bicep at biggest point?) involving a built-in bra. Oh, dearest God, please don’t let it be. Hahaha I can’t wait to see you in your bodysuit. And congratulations on getting the job! A lot of these measurements seem to be redundant. I mean, with 9, 11, 14, 16 and a little pythagorean magic, do they really need to ask for 18? Really now. lol grats on the job!! sounds awesome :) I hear the expo is quite insane..
Tanks:) And haha yeah, it’s a much bigger deal here than the sleep-inducing font on the NYC Times Square ad (have you seen it?) might suggest. Speaking of redundant, they requested a ‘full frontal’ photo a couple days later to double-check our reports. I sent them a clothed one, hope that was ok.